Our Memorial Day weekend adventures included a stop at the J.Crew Factory store for a few much needed items for Mark. While the late spring weeks have been rough on my #contentmentchallenge -- read I fell off the wagon, but there is grace people, there is grace -- stepping into this store was particularly difficult. I spent the first four months of the year without shopping at all. As warmer temperatures began to creep up and we planned trips and a full wedding season, shopping slipped back into my routine. But with the support of my mom and a few friends, I reinvigorated my summer clothes. I have been actively streamlining my wardrobe. And while I will likely never adopt the "capsule wardrobe" in the purest form, having less had been liberating. Re-trying on my clothes and reminding myself of what I actually own has been both encouraging and somewhat therapeutic. I seem to have short term memory loss when it comes to the clothes I own, having to frequently remind myself that I am suitably outfitted. But people, I have a weak spot for pants and shorts. I would gladly wear the same shirt every day if I could mix up my bottoms. So odd, right? For this reason, that store had me in a daze of pretty things. I was a walking heart eyed emoji. The graphic shorts! They are spot on this summer. We left without any purchases for me and were glad. I am officially back on track with my #contentmentchallenge But man, the shorts were lovely. 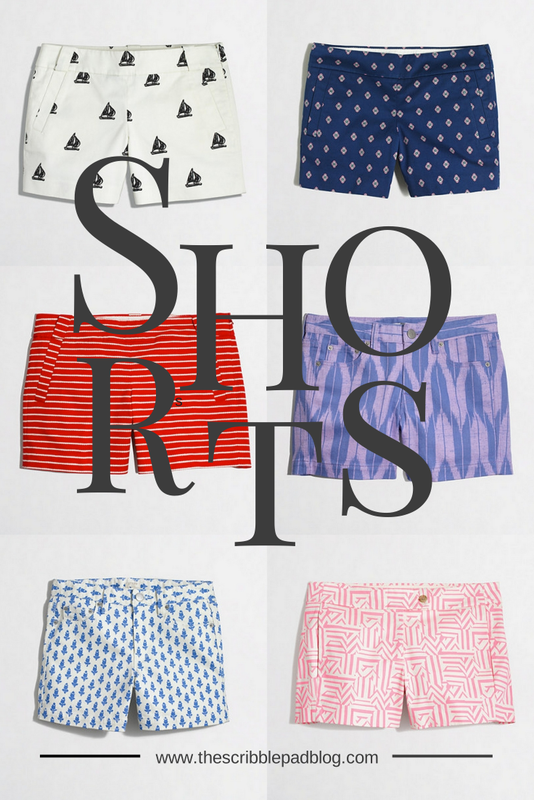 If you are in the market for shorts, J.Crew Factory has got you covered, including all the pretties pictured above. Bonus, their denim short options aren't bad either! Pssst...if I was shopping right now, I would also buy this bag, perfect for summer. If only there was a way to make money while amassing a collection of bags. Have you ever done a shopping freeze or contentment challenge? What are your summer-time staples? And do you also have a thing for pants and shorts?